No more disposable table covers or generic table cloths! Complete your booth with a custom-designed trade show table skirt or throw cover in your company colors. Proudly display your company logo or corporate images on a table skirt perfect for a 6’ or 8’ table. Enjoy the look of a custom displays without the financial investment. 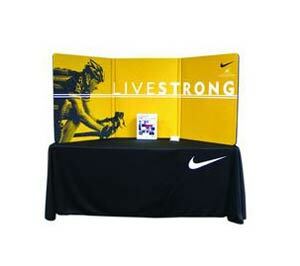 Trade show table skirts are an economical way to go from drab to dynamite! Designed for table top trade show displays, the table skirts are colorful and custom-designed to feature your company brand. Choose from a wide selection of table skirt colors – available in 35 colors! Add one- or two-color custom logo designs to your table skirt in over 17 colors! Lightweight – weighs about 4 lbs. Event attendees will immediately know your trade show booth when they recognize your corporate logo and colors professionally displayed on a table skirt by E&E Exhibit Solutions. Complete the look of your booth with a table skirt crafted to complement your other marketing images and brand messages. Have a question about the cover or skirt for your needs?